Plant Notes: This species is part of an Old World clade of Psychotria with leaf nodules harboring symbiotic bacteria (Razafimandimbison et al. 2014). Though once speculated to be involved in nitrogen fixation, recent evidence suggests the bacteria in the nodules are crucial for the production of secondary metabolites such as C7N aminocyclitols (Carlier et al. 2013). Citation PSYCHOTRIA PUNCTATA Vatke, Oesterr. Bot. Z. 25: 230. 1875. Type: ZANZIBAR: Without data, Hildebrandt 1136 (holotype: W; isotypes: BM, K). Apomuria punctata Apomuria punctata (Vatke) Bremekamp, Verh. Kon. Ned. Akad. Wetensch., Afd. Natuurk., Tweede Sect., ser. 2. 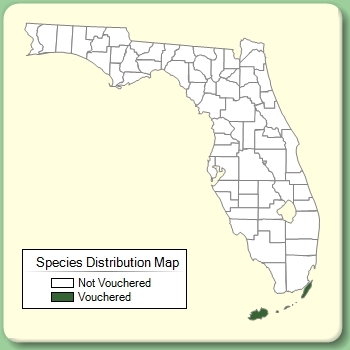 54(5): 91. 1963. BASIONYM: Psychotria punctata Vatke 1875. Uragoga punctata Uragoga punctata (Vatke) Kuntze, Revis. Gen. Pl. 2: 962. 1891. BASIONYM: Psychotria punctata Vatke 1875. Psychotria bacteriophila Psychotria bacteriophila Valeton, Icon. Bogor. 3: 187, t. 271. 1908. TYPE: COMORO ISLANDS: Cult. in Java, without data (holotype: BZF; isotype: L). Psychotria beniensis Psychotria beniensis De Wildeman, Pl. Bequaert. 2: 333. 1924. TYPE: ZAIRE: Beni, 4 Jun 1914, Bequaert 3422 (holotype: BR). Psychotria ciliatocostata Psychotria ciliatocostata Cufodontis, Nuovo Giorn. Bot. Ital., ser. 2. 55: 90. 1948. BASIONYM: Psychotria puncata Vatke, var. hirtella Chiovenda 1939. Psychotria collicola Psychotria collicola K. Schumann, Bot. Jahrb. Syst. 33: 364. 1903. TYPE: TANZANIA: Usaramo, E of Mtondwe, Jul 1894, Stuhlmann 8281 (holotype: B(destr.)). Psychotria hirtella Psychotria hirtella Oliver, Trans. Linn. Soc. London, Bot. 2: 336. 1887. TYPE: TANZANIA: Kilimanjaro, Oct 1884, Johnston s.n. (holotype: K; isotype:: BM). Psychotria kaessneri Psychotria kaessneri Bremekamp, J. Bot. 71: 278. 1933. TYPE: KENYA: Muka, 29 May 1902, Kässner 923 (holotype: K; isotype: BM). Psychotria kirkii Psychotria kirkii Hiern, in Oliver, Fl. Trop. Afr. 3: 206. 1877. TYPE: MOZAMBIQUE: Morumballa, 18 Jan 1863, Kirk 9 (holotype: K). Psychotria kirkii var. hirtella Psychotria kirkii Hiern, var. hirtella (Oliver) Verdcourt, Kew Bull. 28:: 321. 1973. 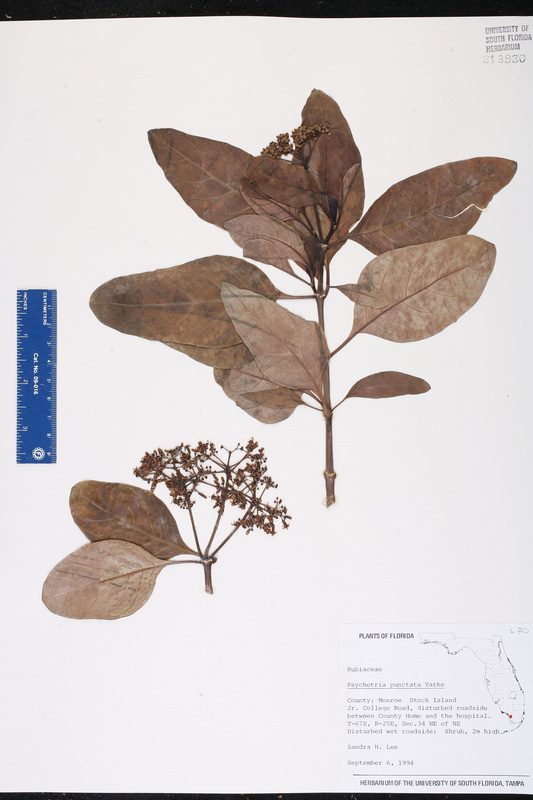 BASIONYM: Psychotria hirtella Oliver 1887. Psychotria kirkii var. mucronata Psychotria kirkii Hiern, var. mucronata (Hiern) Verdcourt, Kew Bull. 30:: 263. 1975. BASIONYM: Psychotria mucronata Hiern 1877. Psychotria kirkii var. nairobiensis Psychotria kirkii Hiern, var. nairobiensis (Bremekamp) Verdcourt, Kew Bull. 30: 262. 1975. BASIONYM: Psychotria nairobiensis Bremekamp 1933. Psychotria kirkii var. swynnertonii Psychotria kirkii Hiern, var. swynnertonii (Bremekamp) Verdcourt, Kew Bull. 30: 263. 1975. BASIONYM: Psychotria swynnertonii Bremekamp 1933. Psychotria kirkii var. tarambassica Psychotria kirkii Hiern, var. tarambassica (Bremekamp) Verdcourt, Kew Bull. 30: 263. 1975. BASIONYM: Psychotria tarambassica Bremekamp 1933. Psychotria kirkii var. volkensii Psychotria kirkii Hiern, var. volkensii (K. Schumann) Verdcourt, Kew Bull. 30: 262. 1975. BASIONYM: Psychotria volkensii K. Schumann 1895. Psychotria maculata Psychotria maculata S. Moore, J. Bot. 44: 84. 1906. TYPE: UGANDA: Entebbe, 14 Aug 1905, Bagshawe 694 (holotype: BM). Psychotria marginata Psychotria marginata Bremekamp, J. Bot. 71: 279. 1933, non Swartz 1788, nec Schlechtendal 1857. TYPE: TANZANIA: Kondoa Distr., Kolo, 21 Jan 1928, Burtt 1258 (holotype: K). Psychotria mucronata Psychotria mucronata Hiern, in Oliver, Fl. Trop. Afr. 3: 211. 1877. TYPE: SUDAN: Kjur, Seriba Ghattas, 6 Feb 1869, Schweinfurth s.n. (holotype: K; isotypes: P(3 shts)). Psychotria nairobiensis Psychotria nairobiensis Bremekamp, J. Bot. 71: 278. 1933. TYPE: KENYA: Nairobi, 22 Sep 1916, Dawson 490 (holotype: K; isotype: EA). Psychotria pachyclada Psychotria pachyclada K. Schumann & K. Krause, Bot. Jahrb. Syst. 39: 558. 1907. TYPE: TANZANIA: Kilwa Distr., Maliwe, s.d., Busse 457 (holotype: B(destroyed); isotype: EA). Psychotria petroxenos Psychotria petroxenos K. Schumann & K. Krause, Bot. Jahrb. Syst. 39: 557. 1907. TYPE: TANZANIA: Near Bandera, 21 Jan 1901, Busse 905 (holotype: B(destr. ); isotype: EA). Psychotria rutshuruensis Psychotria rutshuruensis De Wildeman, Pl. Bequaert. 2: 417. 1924. TYPE: ZEIRE: Rutshuru, 17 Nov 1914, Bequaert 6207 (holotype: BR; isotype: BR). Psychotria subhirtella Psychotria subhirtella K. Schumann, in Engler, Pflanzenw. Ost-Afrikas C: 360. 1895. TYPE: TANZANIA: Kilimanjaro, JMarangu, Jul 1890, Volkens 1455 (holotype: B(destr. ); isotypes: BM, PRE). Psychotria swynnertonii Psychotria swynnertonii Bremekamp, J. Bot. 71: 277. 1933. TYPE: TANZANIA: Kilosa, 20 Jan 1922, Swynnerton 770 (lectotype: BM; isolectotype: K). Lectotypified by Verdcourt, Kew Bull. 30: 263. 1975. Psychotria tarambassica Psychotria tarambassica Bremekamp, J. Bot. 71: 280. 1933. 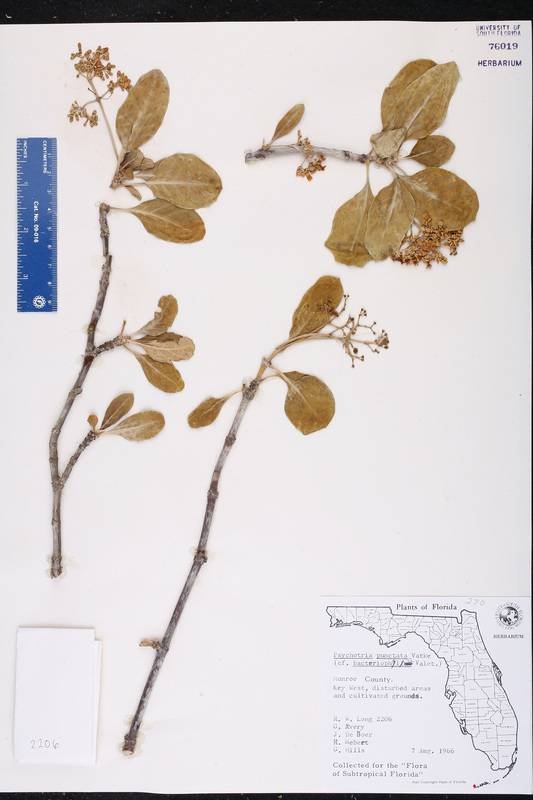 TYPE: KENYA: Kamasia, Tarambass Forest, 11 Jan 1930, Dale 2436 (holotype: K; isotype: EA). Psychotria volkensii Psychotria volkensii K. Schumann, in Engler, Pflanzenw. Ost-Afrikas C: 360. 1895. TYPE: TANZANIA: Kilimanjaro, Marangu, Jul 1893, Vlkens 604 (lectotype: K; isolectotypes: B(destr. ), BM(2 shts)). Lectotypified by Petit, Bull. Jard Bot. État Bruxelles 36: 113. 1966. Uragoga kirkii Uragoga kirkii (Hiern) Kuntze, Revis. Gen. Pl. 2: 961. 1891. BASIONYM: Psychotria kirkii Hiern 1877. Uragoga mucronata Uragoga mucronata (Hiern) Kuntze, Revis. Gen. Pl. 2: 961. 1891. 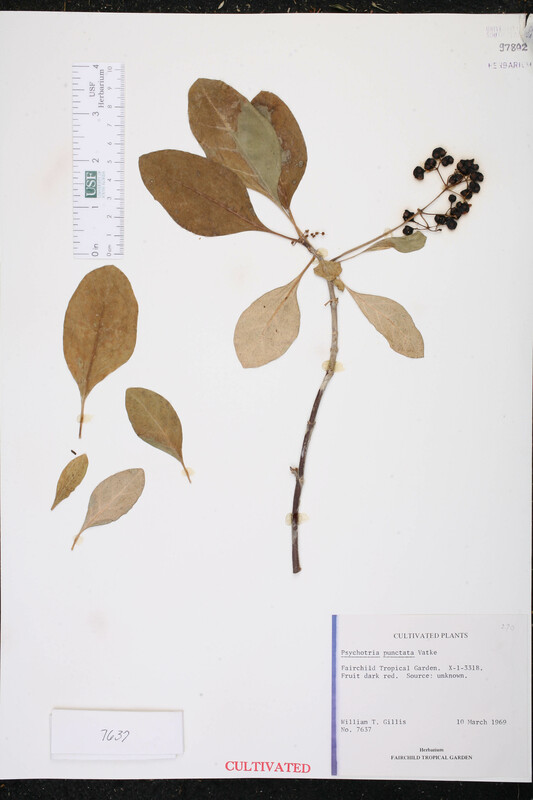 BASIONYM: Psychotria mucronata Hiern 1877. USA Florida Monroe Co. 06 Sep 1994 S. H. Lee s.n. USA Florida Miami-Dade Co. 10 Mar 1969 W. T. Gillis 7637 CULTIVATED. X-1-331B; source: unknown.